Kings Of Leon have fended off strong competition from Lady Gaga to become the UK's biggest-selling digital artists. 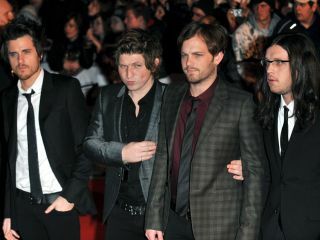 According to the BBC, Kings Of Leon's fourth album, Only By The Night, released in 2008, has been downloaded over a quarter of a million times in the UK. Martin Talbot, the managing director of the Official Charts Company, said, "The success of Kings Of Leon illustrates the growing popularity of album downloading among music fans." Lady Gaga's album The Fame is the second best-selling digital album in Great Britain, while Florence And The Machine's Lungs is in third place. Rounding out the top five are Lily Allen's It's Not Me, It's You and Coldplay's Viva La Vida Or Death And All His Friends. Despite claims that they were going to take an extended hiatus, Kings Of Leon are set to play this summer in London's Hype Park as well as headline the V Festival.